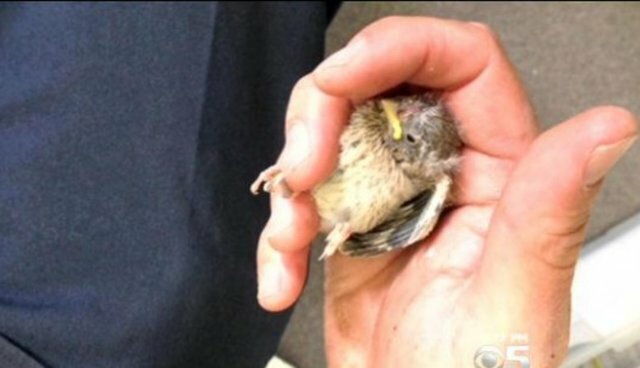 A team of firefighters in the Bay Area town of Marinwood stopped at nothing to save an injured baby bird on Monday, devising an instrument made of just about every household item they could find in order to pull the newborn finch out from a drainpipe. After spotting two adult birds anxiously waiting beneath a pipe at their fire station, firefighters determined that their chick had become trapped several feet down. Naturally, they became set on getting the bird out -- so they did whatever they could to rescue the chick, attaching a garden hose to a vacuum cleaner and snaking it through the pipe with a glow-stick and a GoPro camera to guide them. "We had to brainstorm how to get the bird out and minimize the injuries," one of the firefighters, Brian Smith, told a local CBS affiliate. "It wasn't our most technical rescue -- but it was certainly one of our more memorable ones." Smith and his colleagues were able to reach the baby bird after four attempts snaking the hose contraption through the pipe. The finch was taken to the nearby WildCare center, where he'll stay for the next five to six weeks. His recovery has already started off well, and the bird has reportedly been hopping happily around the center.